I am so excited to announce a few things. For “The Bargain” fans, the season finale is on its way. My editor is having one more look at it to make sure it sparkles when it shows up on your Kindle. It will also be available in Paperback, too. Today, I must share with you the cover for my next serial novel that will release in January 2016. Winning in the courts, vanquishing England’s foes on the battlefield, Bradley Norton has used these winner-take-all rules to script his life, but is London’s most distinguished mulatto barrister prepared to win the ultimate fight, restoring his wife’s love? Amora Norton is running out of time. The shadows in her mind, which threaten her sanity and alienate Bradley’s love, have returned. How many others will die if she can’t piece together her shattered memories? Can she trust that Bradley’s new found care is about saving their marriage rather than winning the trial of the century? This story of Bradley and Amora’s is very dear. Parts of their tale made me weep. I hope it lives up to my heroes like Jo Beverly, Beverly Jenkins, and Laurie Alice Eakes who weave suspense into their sweeping romances. Unveiling Love is a serialized story or soap opera told in episodes. Each episode averages three to eight chapters, about 15,000 to 30,000 words. Each episode resolves one issue. Emotional cliffhangers may be offered, but the plot, the action of the episode, will be complete in resolving the main issue. My promise to you is that the action will be compelling, and I will tell you in the forward the length of the episode. I’ve been away for a bit as I immersed myself in my latest writing projects. As you all know, I love the Regency, the mannerism, the wit, and the fashions. I am intrigued by the challenges the people of the times faced: the complexity and aftermath of war, the stark differences in the rights of women versus men, and the growing social consciousness. Did you know London was very diverse with large Jewish and African populations? Yet, it is very rare to see these aspects in Regency fiction. Except for my dear friend Ruth Axtell’s book, The Winter is Past, you do not typically see a racially diverse cast of characters. I, an African American writer, am guilty of this, too. In my debut book, Madeline’s Protector, Justain’s conscience figure, Mason, was originally a free black, but I edited it out, thinking that such a close relationship between an earl and his black man-of-all-work wouldn’t pass the sniff test or even would upset some because he’s killed early in the book. I didn’t trust my audience as much as I should’ve, nor did I trust my ability to tell the tale. And if I had such worries, I can imagine how others feel when they lift pen to paper trying to write a historically accurate, compelling, and marketable tale. Those three components differ based on the eye or pocketbook of the beholder: Traditional Presses versus Indie Pubs, niche marketing versus mainstream pitches, Christian Bookseller Association versus American Bookseller Association, etc. I applaud everyone brave enough to write their story in the way that they feel is right. I just know that for me and my pen, my laptop and smart phone, we shall tell the story and the whole story from now on, so help me God. But London was diverse. And doesn’t love always win? Let me show you some images. At first glance they may offend, but that is not my intent. With the sweetness of the Regency, one must also accept the bitter dregs, the things that have been swept away, because it is ugly. 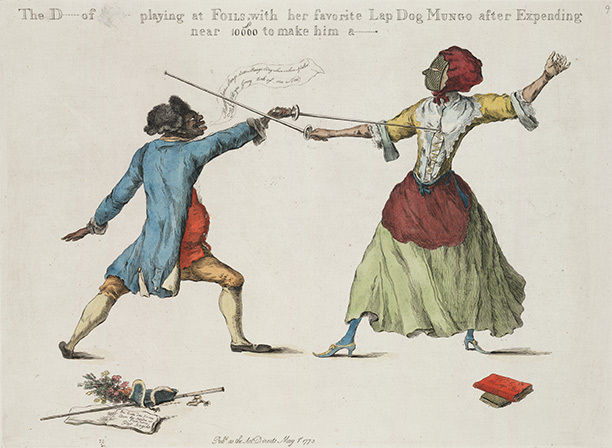 This is William Austin’s 1773 caricature: ‘The Duchess of (Queensbury) playing at Foils with her favorite lap dog Mungo’. This cartoon was meant to shame the duchess for spending 10,000 pounds (1 Million pounds in 2015 dollars) to teach one of her loyal servants, Soubise, how to fence. Soubise was treated like a son to the duchess. Think of the trust the duchess must’ve had in this black man to invest that sum in his education and to trust him to wield a sword. But was he so unusual in the Duchess’s world? 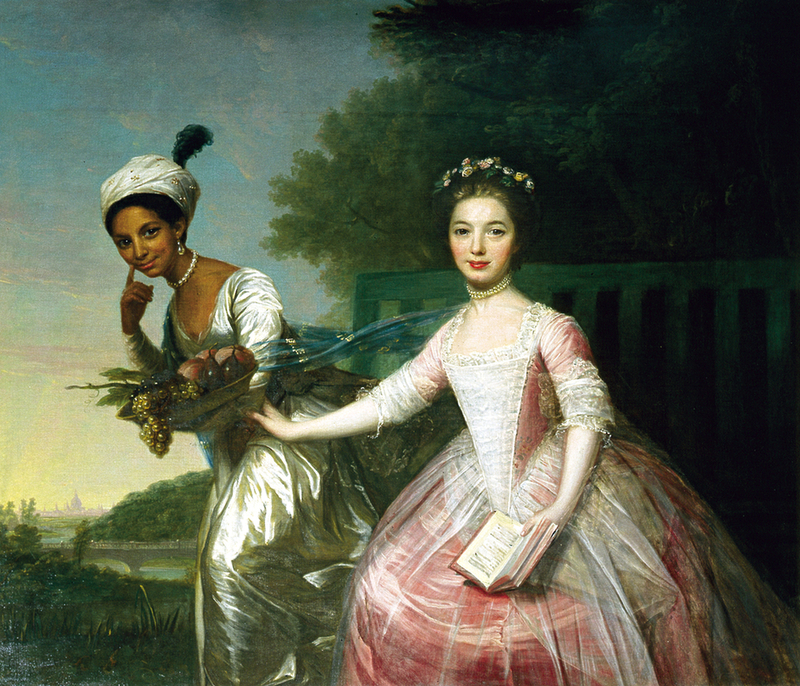 By Regency times, historians, Kirstin Olsen and Gretchen Holbrook Gerzina, estimate that Black London (the black neighborhood of London) had over 10,000 residents. While England led the world in granting rights to the enslaved and ending legal slavery thirty years before the American Civil War, it still had many citizens who were against change. Here is another image from an anti-abolitionist. This image is from 1819, a cartoon by George Cruikshank. It is supposed to depict an abolitionist’s dinner party, but it just shows fear of the races intermingling. It serves as a reminder of how many thought of blacks and how it was ingrained in the times. 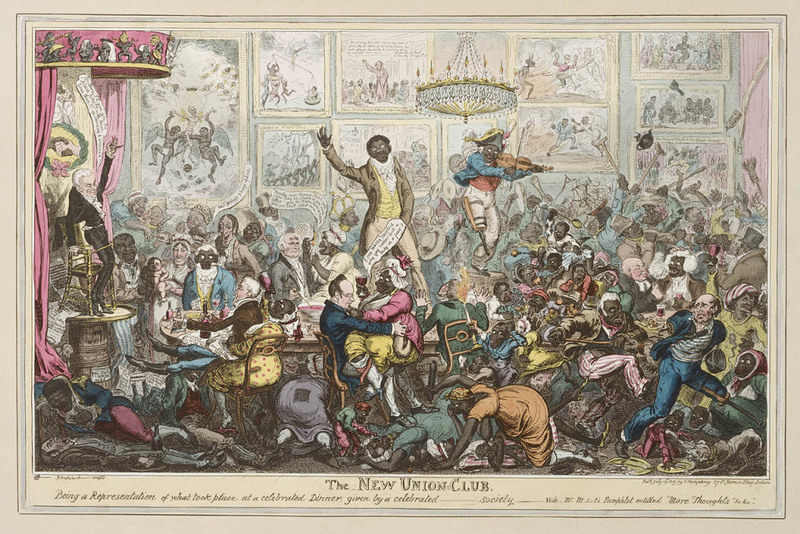 Notice the half-black half-white baby, the promiscuous woman sitting on the gentleman’s lap, the black-face additions to the artwork, the violence and chaos, even the blood shed amongst the party goers. How many laughs did it draw in the parlors and drawings rooms of polite society? Moreover, how did the enslaved and free servants or the black men who owned shops feel fetching this paper to their masters, their employers, or watching it enfolded in the hands of their patrons? Cruikshank drew fear, and he wouldn’t have, if Regency society didn’t possess it. For Cruikshank, a rising black middle class, intermingling in society, gaining in social power and wealth, was something to dread. Is this ugliness, this truth, the reason the fictional landscape of Regency exhibits stories abscent diversity and color? Does showing black or brown or yellow historical faces mean that the ugliness must also show? Perhaps, or perhaps not. But to pretend it did not exist is to dishonor every person who received a racial slur and turned the other cheek, the unknown man lynched for the fault of his birth, or every fallen soldier felled on the road to equality. My goal is to show through the stories pressing upon my spirit that truth and love can coexist on a diverse canvas. When love arrives, the picture changes and even the bad can be borne and overcome. Here’s a picture showing love winning. Look at these two cousins, Dido and Elizabeth. Their great uncle, Lord Mansfield, loved them both and had them arrayed in fashionable apparel and pearls for this portrait. Both ladies are trapped by their circumstances, Dido by her race and Elizabeth by her lack of an inheritance. Johan Zoffany paints them, particularly Dido with no grotesques features, no overt subservient positioning, no hint of promiscuity or evil, just two lovely women. It would be great if the date of these images showed progress, the growing changes in London society. They don’t. No, they just show truth. The landscape of Regency London was diverse and enlightened hearts embraced the diversity with love. 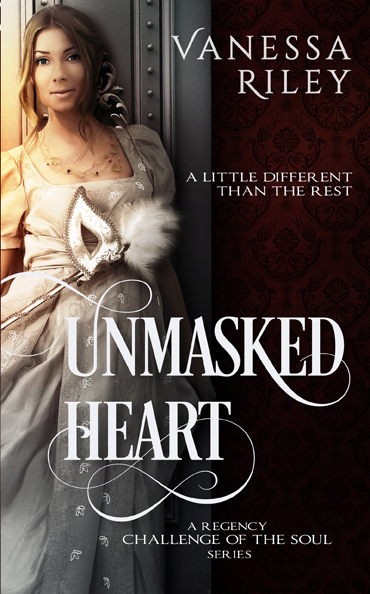 My second full length novel, Unmasked Heart releases on June 15, 2015. Gaia Telfair is a different kind of heroine. She’s a mulatto, with both black and white blood coursing within her veins, only she didn’t know it until she reached for love.